Some people will call this “ranchero style cheese” because this type of cheeses are more common to be found at the markets being sold by people that come to sell them from the nearby ranches or farms. What you will find at the city supermarkets will be the ones produced in massive quantities by large cheese factories, but lack the flavor and sometimes organic characteristics of these cheeses that will vary on taste and shapes depending on the regions of México. 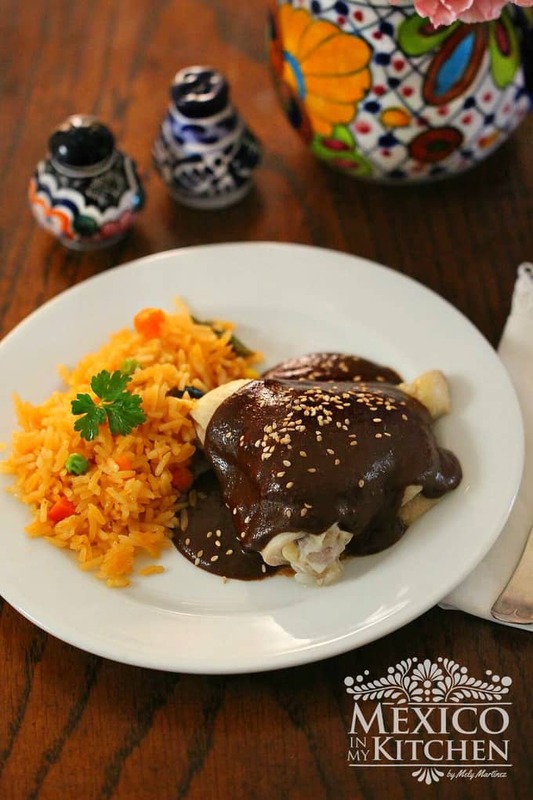 The Spaniards introduced cows, sheep, and goats to the Mexican culture, and soon after, they started making cheese, but the arrival of Germans, French and Swiss immigrants gave the process of making cheese in Mexico a different twist. Like the Aged cheese “(Queso Añejo)”, Manchego cheese (melting cheese) and the Mennonite Cheese from the Mexican state of Chihuahua, similar to Muenster cheese in the United States. All these cheeses have a close and tasteful resemblance of the European-made cheeses from which we inherited them more than 300 years ago. 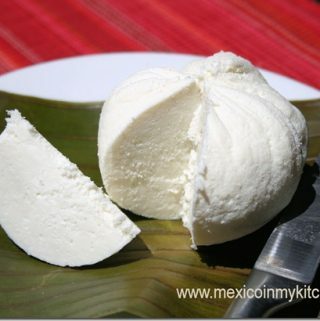 Of course, there is the famous Queso Oaxaca, also known as the Mexican Fresh Mozzarella. But one of my favorites is aged and crumbling cheese from Tabasco and Chiapas in a brick like a shape-preserved with a cover of wax. This cheese has a creamy-crumble texture ideal for empanadas and enchiladas. There is a lot of history behind our cheese to tell in just one post, my hope is that you enjoy just a little bit of it as much as I do. While the milk is heating, dissolve the rennet tablet with the 2 tablespoons of water. Once the milk is at the temperature needed add the rennet stir thoroughly for about 5 seconds and let the mixture rest for about 1 hour or less depending on the type of rennet used. The curds will start to form. It could form a solid mass that won’t stick to your fingers and will be separated from the way. Used a knife to cut the curds into small pieces. Place the curds in a cheesecloth over a large bowl or container to catch the drips. Take the 4 corners of the cheesecloth and form a bag with it. Put some pressure in the cheese cloth to drain as much liquid as possible. Open the bag add the salt. Stir the curds with your hands or if you prefer place it in your food processor to form a fine and crumbly mixture. Optional: At this time you could add finely chopped Epazote Herb leaves, jalapeño pepper or Red Bell pepper to give the cheese a different flavor. Place it back in the cheesecloth and hang until the cheese is firm and slightly drained like in the picture. About 1 and 1/2 hour. Unwrap and let it rest for one more hour. Refrigerate it after this time. You can also place the curds into round molds and leave them to drain. Leave them at the same time as above and turn over when completely drained. Here they are draining in the top of the broiling tray. That is the only thing that came to my mind where they could drain without making a mess. With the leftover whey, you could make “Requeson”, ricotta cheese. Just heat the drained whey over a low heat and let it simmer until a new set of firm curds forms and drain using the cheesecloth. Fresh Mexican Cheese. This cheese has a creamy-crumble texture ideal for empanadas and enchiladas. There is a lot of history behind our cheese to tell in just one post, my hope is that you enjoy just a little bit of it as much as I do. Heat the milk to about 110F , if you do not have a candy thermometer you can test the milk by placing a small drop in your hand, the milk is ready when you can barely stand the heat of it. Please do not burn yourself. Be cautious. While the milk is heating, dissolve the rennet tablet with the 2 tablespoon of water. Once the milk is at the temperature needed add the rennet stir thoroughly for about 5 seconds and let the mixture rest for about 1 hour or less depending of the type of rennet used. The curds will start to form. It could form a solid mass that won’t stick to your fingers and will be separated from the whey. Used a knife to cut the curds in small pieces. Place the curds in a cheese cloth over a large bowl or container to catch the drips. Take the 4 corners of the cheese cloth and form a bag with it. Place it back in the cheese cloth and hang until the cheese if firm and slightly drained like in the picture. About 1 and 1/2 hour. Unwrap and let it rest for one more hour. Refrigerate it after this time. You can also place the curds into round molds and leave them to drain. Leave them for the same time as above and turn over when completely drained. Here they are draining in top of the broiling tray. That is the only thing that came to my mind where they could drain without making a mess. With the leftover whey, you could make “Requeson” , ricotta cheese. Just heat the drained whey over a low heat and let it simmer until a new set of firm curds forms and drain using the cheese cloth. • * I have used milk from the supermarket and it works fine. • ** These tablets are usually sold at Hispanic Stores. And the price range is 50 cents each. Or you could buy liquid rennet online and use it according to the manufacture instructions. If you don’t find the rennet, I had also made cheese using 2 tablespoons of white vinegar or lime juice when rennet is not available. So no excuse, you can make it. I need to ask about this part, "add the rennet stir thoroughly for about 5 seconds and let the mixture rest for about 1 hour" with the stove On holding the 110F temperature or i can shut the stove off and let it rest for 1 hour? Hello Addie, as any other dairy cheese tends to get sour tasting after some days. It will last fresh at least for 4-5 days if we keep in a low temperature in our refrigerator. Check the thermostat in your fridge, maybe you need to lower the temperature a little bit down. Hello. Thanks for the instruction. I don't speak Spanish. what words are used to ask for rennet at the no english Mexican grocery? Thank you. Gracias! I've been to a few places asking for cuajo and pointring to the cheese, lol. I haven't found ant yet. I used fresh cows milk. Did everything expect didnt use chesse cloth i used my chilli strainer. And it came out good. But only just a little bit of chesse was made how much chesse is made out of gallon fresh milk. And its queso fresco. I made. I have a pic but dont know how to load it on here. It usually makes one pound cheese. That also depends on the type of milk you use. Raw milk will render that size of cheese, and using store bought whole milk a smaller cheese. Just reheat and let it sit until is forms the cheese. Happy cooking! ty Mely will try it out. To all potential cheese makers; I have been making cheeses for over 12 years and have made many types and flavors of cheeses and found out that the "ultra pasteurized milk" will not curd up and make into cheese. It should be labeled as such on the carton or the plastic jug. Ultra Pasteurized milk is pasteurized at very high temperatures and it is cooked to prolong shelf life and long transportation distances. To make cheese use only pasteurized homogenized milk when buying from the supermarket. Para las personas que hacen o piensen hacer queso con leche adquirida en el super-mercado; Yo he estado haciendo queso casero por 12 anos aproximadamente, de muchos tipos y sabores y he encontrado que la leche adquiritda en el super-mercado que esta marcada "Ultra-Pasteurized" no hace el cuajo necesario para hacer queso. Este tipo de leche a sido pasteurizada en altas temperaturas para que aguante largos tiempos en el refrigerador o en camino largo rumbo al mercado. Para hacer queso con leche adquirida en el super-mercado solo puede usar leche marcada "Pasteurized and Homogenized" para que pueda formar e cuajo que se convierte en queso. I know you can add cream, but it has to be raw milk and cream. Some cheeses, like those from Chiapas & Tabasco are rich in cream. Since this is something that I had never tried, I can not give you exact amounts. Sorry about it. If you make it, please come back and share you experience. Also, read the comment about from someone that also makes cheese. How long will this cheese keep in the refrigerator? This cheese will keep good for about 5-6 days in the fridge.